Goodbye CGS-13, see you at CGS-14! 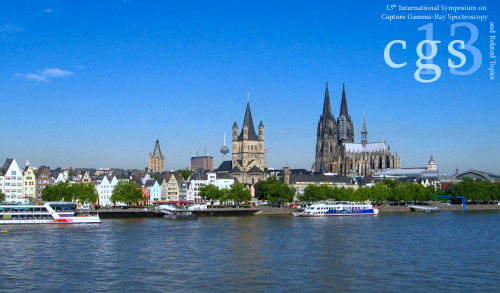 The Thirteenth International Symposium on Capture Gamma-Ray Spectroscopy and Related Topics has been organized by the Institute of Nuclear Physics of the University of Cologne (Germany). This Symposium was the thirteenth in a series of meetings held previously in Studsvik, Sweden (1969); Petten, The Netherlands (1974); Brookhaven, USA (1978); Grenoble, France (1981); Knoxville, USA (1984); Leuven, Belgium (1987); Asilomar, USA (1990); Fribourg, Switzerland (1993); Budapest, Hungary (1996); Santa Fe, USA (1999); Prague, Czech Republic (2002) and South Bend, USA (2005).